Keyword research is critical for SEO but it can do much more in aligning your entire digital marketing strategy. Try these free keyword research tools to get an immediate and powerful glimpse of your space and then dominate it. Do it! Commit to gut-checking every single thing you write against some quick research. Brainstorm a list of search questions people use to find you. Use Google Suggest and Google's "Searches related to..." at the bottom of the page. Enter terms into Keyword Search tools to get actual search volume and competitive measures. Structure your website, headlines, links, tagging, image names & alt tags and page summaries to use phrases from the analysis. Season everything with your voice. In the history of marketing, the minds of your future customers have never been more accessible than they are with today’s free keyword research tools. The answer, by-the-way is 20 calories - courtesy of Google's rich snippet. When you structure your site — your everything — as answers to questions; answers that millions, if not hundreds of millions have been written for, you are starting where your future customers are. That’s where you go to meet them and then lead them through a journey of how you’re different and why they should provide an email address or a follow so you can continue the conversation. It’s the quickest way to learning how to speak to the customers you’ve never had. Use Keyword Research to re-look at your messaging outside of yourself. And then invest fully into structuring everything around keyword research as the architecture of your digital marketing. Then, fill in, off-shoot — flavor that structure with your unique qualities, your brand and most importantly, actual customer stories – which is the journey. Customer stories are 100% owned by you and real. That’s what differentiates you the most when you start a conversation where millions of others have. 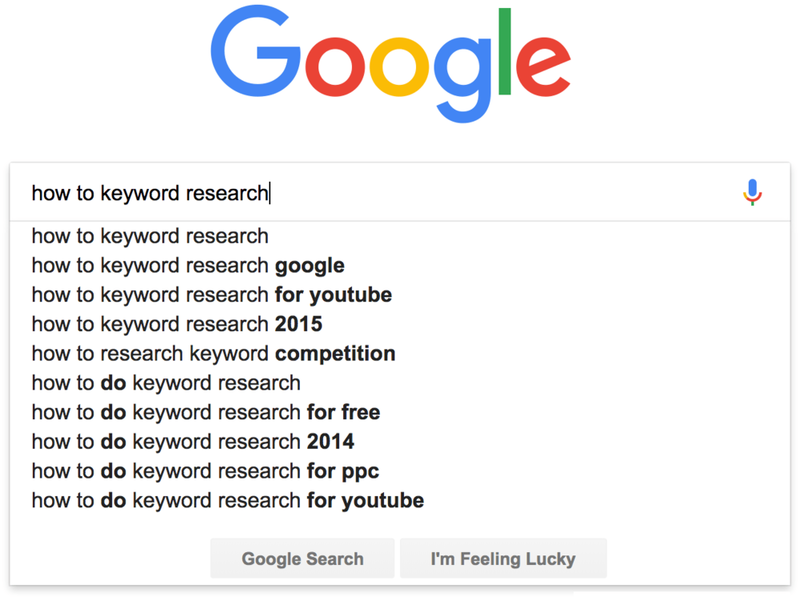 Below is a 5 step process of free keyword research and then a real example of a customer story that taught us the importance of keyword research. It changed our business. It costs you nothing but a little time to change yours. Most keyword research tools you’ll find provide free trials that cost from $100 to $500 per month, and they’re great! If you find you really want to get super deep in these types of analysis, the paid options will take you there – but you don’t need to spend any money to create dramatic results with the free options. Type you keyword phrase and note the different searches. You're getting the most popular of billions of transactions instantly. Fine-tune your keyword string that matches closest to what people are searching for. *Ads have been removed to focus on organic listings. Read the titles and short descriptions of the top 114 million pages on digital marketing (aka: your keyword phrase). What's the flavor of what people are looking for? Google has been shifting towards more informational links at the top vs product or service sells. How are the titles of the search results structured? Study the short descriptions under each which motivate people to click through as the descriptions provide clues as to what to expect. Click through into the top stories and skim through the structure of the articles. Does the story you want to tell fit within the cluster of results around these companies and organizations? Can you start with any of these positions and then lead the visitor towards what you want to talk about? Visit Ubersuggest and type in a keyword phrase to get back many varieties of your search with search volume, current cost per click and competition. Low volume and low competition are great targets to write about or structure your offering around. Two ways you can use this. Think of your top navigation or landing pages centering around high search volume terms as they relate to your key offering so that you make it super easy for someone to find you and then get to what they want. You should also write blog posts around popular terms in that those terms are primary in the title. Use a variety of terms (regardless of volume) across all of your content as if the selection of terms and phrases make up your own spice - your special blend. Season everything you write or even speak about, with this spice but don't over do it. This will tie everything together and provide strong continuity for both your visitors and the search engines. Keep in mind that a super high volume with low cost-per-click and low competition can mean that it's too general. Skip general, it's wasted traffic and wasted content in that your valuable targets have to work harder to get what they're after.